Although Tyrone and Fermanagh both once had an extensive railway network, today nothing is left. 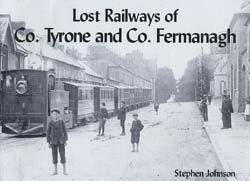 The lines, stations and engines, all now gone, are recalled in this book which features over fifty rare photographs and a comprehensive account of the counties' railway history by Irish railway expert, Stephen Johnson. Featuring sections on the Clogher Valley Railway and its amazing steam railcars (see the front cover where a CVR railcar rolls up the middle of Caledon main street) and the wonderful Fintona Horse Tram.